Health Visions from Dr. Jackson? Was it God? Or Dr. Jackson? "Question on the Vision .--Did you receive your views upon health reform before visiting the Health Institute at Dansville, New York, or before you had read works on the subject? 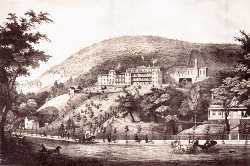 "I did not visit Dansville till August, 1864, fourteen months after I had the view. I did not read any works upon health until I had written Spiritual Gifts, volumes 3 and 4, Appeal to Mothers, and had sketched out most of my six articles in the six numbers of How to Live . "I did not know that such a paper existed as The Laws of Life, published at Dansville, N.Y. I had not heard of the several works upon health, written by Dr. J. C. Jackson, and other publications at Dansville, at the time I had the view named above. I did not know that such works existed until September, 1863, when in Boston, Mass., my husband saw them advertised in a periodical called the Voice of the Prophets, published by Eld. J. V. Himes. My husband ordered the works from Dansville and received them at Topsham, Maine. His business gave him no time to peruse them, and as I determined not to read them until I had written out my views, the books remained in their wrappers. "My reply was that I had not, neither should I read them till I had fully written out my views, lest it should be said that I have received my light upon the subject of health from physicians, and not from the Lord. The skeptics version: Mrs. White secretly read Dr. Jackson's books, adopted his health reforms, then decided to bring those same reforms to the entire church, but instead of giving Dr. Jackson credit, she pretended God gave her a health reform vision and went around telling everyone the info came straight from Heaven. Mrs. White's version: Mrs. White was given a vision of health reform by God. Later, she happened to come across some writings by Dr. Jackson, and by sheer coincidence they were nearly exactly what she was shown in vision. A closer study of the events will show us which version is the truth. Can it be any plainer than that? God was not interested whatsoever in the reform dress. However, when Mrs. White visited the Dansville clinic she began to see value in the reform dress. Assisting Dr. Jackson at the water cure was his adopted daughter, Dr. Harriet Austin, a fellow hydropathist, who advocated women's dress reform. She was the inventor of the "American Costume", which dispensed with unwieldy floor-length dresses in favor of a mid-length skirt worn over trousers (see picture of Dr. Austin on right). Question to ponder: Who told Ellen White to adopt the reform dress? Was it God or Dr. Austin? To study the subject further, click here. On the surface this statement--not released to the public until the 1980s--seems to be of little import, but it is highly significant in that it shows that at least some of the health reforms that later showed up in Mrs. White's testimonies were first learned from Dr. Jackson. While Mrs. White did not give up salt entirely, she did advise her followers that "food should be prepared" without "an undue amount of salt. "10 Question: Was it God or Dr. Jackson? June 1863 Mrs. White receives health reform "vision"
People noticed the similarity between Mrs. White's writings and Dr. Jackson's writings. Mrs. White admitted James had obtained a set of books on health before her views were written. Mrs. White denies reading "anything" until after she had completed her books. Here is what Mrs. White asks us to believe: God gave her a health reform vision, she wrote it out, and then, to everyone's amazement, the vision "agrees very much" with the teachings of Dr. Jackson. What an amazing coincidence! Despite Mrs. White's bold denial, there is evidence that Mrs. White, an avid reader, had plenty of opportunity to read the writings of Dr. Jackson prior to the publication of her own health writings. Thus we know that the Whites had read at least one article of Dr. Jackson's at least four months prior to the date of the "vision". In fact, James reprinted Jackson's article on Diphtheria in the February 17, 1863, edition of the Review and Herald. On August 13, 1863, one month before James supposedly had any knowledge of Dansville, Dr. Jackson wrote him apologizing for his long delay in replying to White's request for information about his books. It appears that James had written Jackson sometime in June, for in December of 1864 he stated that eighteen months earlier (June 1863) he had sent off to Dansville for some of their books. When the books arrived Mrs. White claimed they remained in the wrappers, but on December 12, 1863, James was mailing Jackson's Consumption from Topsham to a friend, Ira Abbey, in Brookfield, New York. It appears those wrappers came off those books at least nine months prior to Mrs. White writing out her vision! Furthermore, it is likely Ellen White read the article James White printed from Jackson's Laws of Life in the October 27 issue of the Review and Herald.16 Thus we can see that Mrs. White had plenty of opportunity to read the writings of Dr. Jackson prior to the publication of her own articles on health. You decide: Was it God or Dr. Jackson? When did the wrappers come off Dr. Jackson's books? Why do her writings on health so closely resemble the teachings of Dr. Jackson? Why do her teachings on the reform dress mimic those of Dr. Austin? Did Mrs. White receive her health reform teachings from reading and talking with Dr. Jackson? Was it God? Or was it Dr. Jackson? The primary source for this article is: "The Dansville Days", Prophetess of Health pp. 77-101, by Ronald Numbers, Ph.D. Other specific sources (some of them also cited in Prophetess of Health) are listed below. 3. Ellen White, Letter 3, 1865. (To Edson and Willie White, June 13, 1865, MR 5, p. 384). 4. Ellen White, Second Advent Review and Sabbath Herald, October 8, 1867. 5. Ellen White, Testimonies, vol. 1, p. 421. 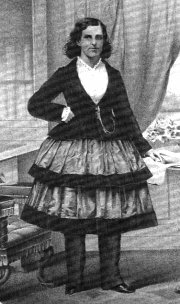 In 1859, Ellen disdained getting involved in dress reform, claiming she had a vision showing its unimportance: "I was shown that the churches in Vermont have been weakened by leaving the important truth to dwell on little things--to dwell on articles of dress and take notice of little things. ... They neglect the great principles of our faith to descend to little particulars. ...leave the brother or sister to the Lord and the angels to convict them of their wrong in dress or furniture or fixings." (Ellen White, Manuscript 1a, 1859) Many of her later writings on dress reform would lead one to believe dress reform, contrary to her "vision", was not a "little thing" after all. 6. Ellen White, Testimonies, vol. 1, p. 525. 7. Arthur White, Ellen G. White Volume 2 The Progressive Years 1862-1876, p. 78, 79. 8. James White, Op. cit. HL, No. 1, p. 12 in Ellen G. White Volume 2 The Progressive Years 1862-1876, page 83. 9. Ellen White, Manuscript Releases vol. 5, p. 402. 10. Ellen White, Temperance, p. 157. 11. Ellen White, Testimonies, vol. 1, p. 290, 296-297. 13. Ellen White, Manuscript 7, 1867. Manuscript Releases vol. 5, pp. 391, 392. 14. "It was at the house of Bro. A. Hilliard, at Otsego, Mich., June 6, 1863, that the great subject of health reform was opened before me in vision." (Review and Herald, Oct. 8, 1867). 15. Arthur White, Progressive Years, Vol. 2, p. 13. 16. J.C. Jackson, "Which Will You Have, Hoops or Health? ", Review and Herald, Oct. 27, 1863. 17. H. E. Carver, "Mrs. E. G. White's Claims to Divine Inspiration Examined", 1872.